President Trump said on Tuesday that he had signed a memo ordering the Department of Justice to propose regulations on bump stocks, instruments that enable the modification of semiautomatic rifles into full-on machine guns. Of course, the actual evidence says that Trump should go well beyond banning bump stocks if he’s serious about preventing more deaths. And, while it is notable that a president who has been open about his love for the Second Amendment has endorsed any measure to restrict gun rights, the timing of his announcement is a little strange. 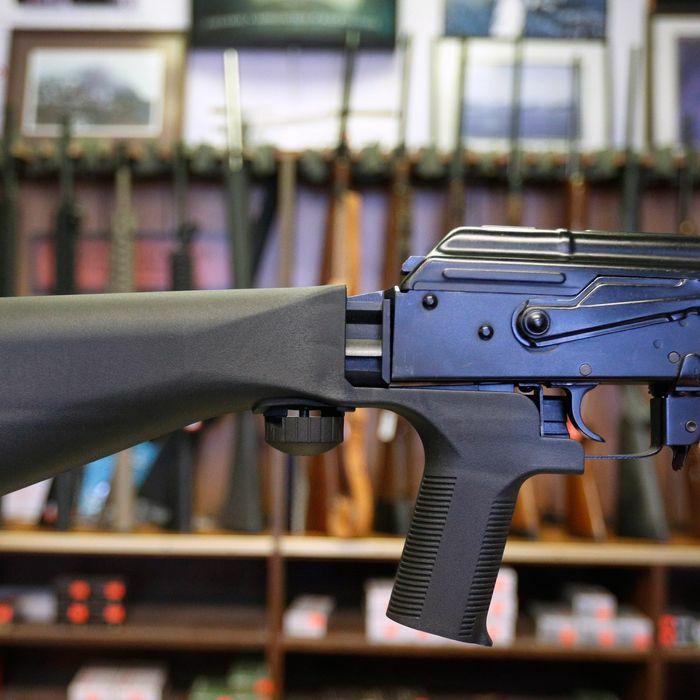 Bump stocks have only been a factor in one of the many high-profile mass shootings in recent years: last year’s massacre in Las Vegas, currently the deadliest in American history. Having modified assault rifles to fire automatically, gunman Stephen Paddock took aim at a country-music concert from his hotel room, killing 58 people and injured over 800. In the aftermath of that horrific event, lawmakers seemed poised to restrict bump stocks, with even the NRA onboard. But, in a familiar turn of events, Congress ended up doing precisely nothing. Though Trump’s move to do it himself may not pass regulatory muster, he likely sees the small-bore measure as a way to show tangible action on guns, as survivors of the Florida shooting — and increasingly, the public — push for change. Separately, Republican senator Pat Toomey said that he would reintroduce an expanded background-check bill that he and Democrat Joe Manchin attempted to usher through the Senate in 2013, after the Sandy Hook Elementary School shootings. That effort failed in the face of Republican opposition. Whether Trump would be on board with that specific measure is unclear, but on Tuesday evening he tweeted a call for improving background checks.